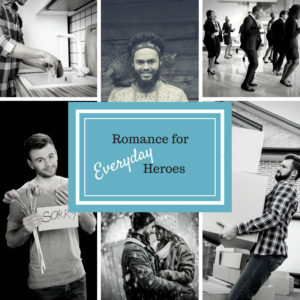 Writing romantic heroes is a lot of fun. They come in all shapes and sizes. I’ve got a soft spot for the grumpy hero, the guy who feels a lot and deeply but presents a stoic face to the world. In Pride and Presents, Steven Dorsey is a bit like that. He’s so used to being on the outside, that being ushered into the middle of the action causes him some stress. Still, he’s also a guy who wants to impress a girl. Here’s a short list of ways even the everyday hero can win the fair maiden. He’s a cat whisperer. Listen. A man who loves my dog? Arrow straight to the heart. Steven meets my heroine’s cat Boots and immediately makes a friend. Make that two friends. He’s handy in the kitchen. As a person who cannot cook, mainly because she hates it with an enduring passion, I am willing to propose on sight to a man who cooks. Not all heroes wear aprons, however, and tiny acts like loading the dishwasher can add some glow. He supports his friends and family. Maybe he can pitch in on a project, like Steven does in Pride and Presents, or puts up with a kid sister’s teasing with humor and grace, but a guy who helps a friend and encourages his family is hot. He learns from his mistakes. My heroes can be really misguided sometimes, mainly when they assume they know all the answers. This is part of the human condition, am I right? Rarer than making mistakes is recovering gracefully with 1) a solid apology and 2) better judgment. Anyone, man or woman, who can punt pride out of the way to learn from a mistake, is impressive. He does the hard thing for all the right reasons. This is what we love about heroes (and heroines), right? Sometimes, that’s the big romantic gesture that saves the day. In Steven’s case, he helps put my heroine’s ex in his place. Twice. All it took was making a spectacle of himself, something Steven doesn’t do. For Beth, he stretches outside his comfort zone. He dances because she needs him to. Sometimes little things are overlooked, but taken together, they add up to the hero.